When I was a 7th grade English teacher, and we had a Poetry unit, I had my students write down the lyrics to their favorite songs to share in class. Then we talked about the lyrics in terms of poetic sense, storytelling, word usage, and emotional resonance. 7th graders love music, but mostly they don’t think they will like poetry (they usually groaned when I announced the Poetry unit). It was kind of hard not to sing the lyrics, but we made ourselves just speak the lyrics, and had some good laughs over the repetition and corniness of some songs. The whole class would usually burst into song at some point during several readings of the lyrics. It was really kind of fun. 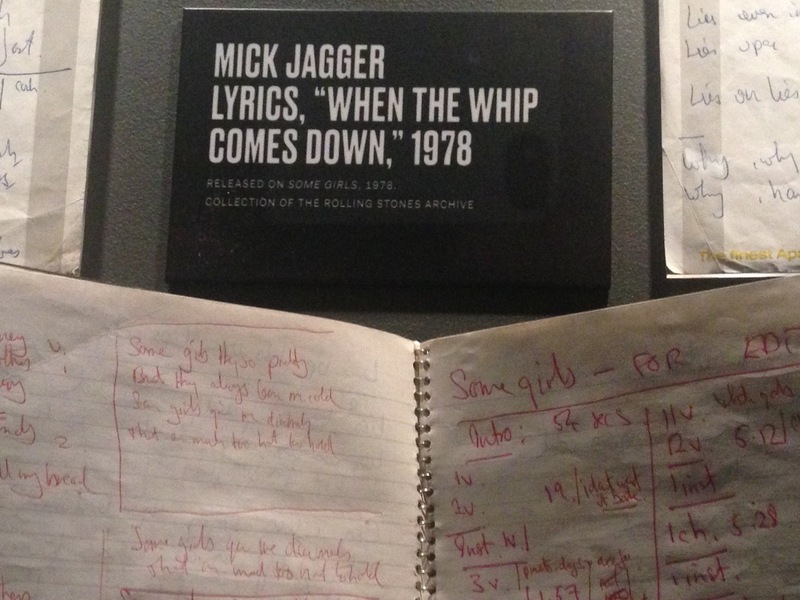 I was reminded of this yesterday when I visited a special exhibit about the Rolling Stones at Navy Pier in Chicago. It was an amazing collection of their guitars, concert posters, photos, videos, clothing, and music. There was one section that had the REAL notebooks that were kept by various band members – notebooks where they wrote down their song lyrics. By hand, with pencils and pens. Just like the rest of us writers (well, maybe not just like…) they started with an idea, or a feeling, and just started writing. They approach the creative process just like the rest of us non-famous writers. By putting one word after another, and trying to make their words sing. Laaaddeeezz and gentlemen… We live in a time when we have seen a man walk on the moon. Hollywood has outdone itself entertaining us with the most outrageous car chases, the most fiery explosions, the biggest stars. I remember when I first heard there was going to be a golf channel. I chuckled to myself and thought, “Now there’s a dumb idea.” I thought the same thing about cell phones. Not to cast aspersions on the sport, but do we really need an entire channel devoted to guys wearing plaid pants and chasing a little ball around? What could be next? The bowling channel? Perhaps ping pong or curling? Now it seems we might be on the verge of a poker channel. And again, I just don’t get it. My husband and college age son seem endlessly entertained by watching poker on TV, and I shudder to think if it was available to them twenty-four hours a day. To my mind you might as well sit around and watch grass grow.